Home News Coin & Tokens IOTA (MIOTA) – The future is here! IOTA (MIOTA) – The future is here! Since its inception, IOTA (MIOTA) has always been a quagmire for many. Some even believe that tangle the technology behind it could make blockchain obsolete. Anywhere the debate as to whether tangle is the future is a story for another day. For now let’s focus on the good news that are hitting IOTA left, right and center and driving up its price up astronomically. A few weeks ago, IOTA was trading at under a dollar, and many were beginning to write it off, then the story changed. It all started with the announcement that IOTA would be used to run the Taipei smart city. This made people realize that there was a massive potential for IOTA to become an integral part of the 21st century city. Let’s face it, many cities today are not well positioned for the needs of 21st century living. The 21st century city will be driven by big data and AI, and only IOTA is best placed to do this, by allowing for seamless machine-to-machine communication. This to a large extent added a significant portion to the IOTA (MIOTA) intrinsic value, and started the upward move. Then two days ago, the possibilities of IOTA (MIOTA) as the tool for driving the next generation of fuel efficient cars became clear in the market. That was after the announcement that an electric car charging station in the Netherlands was testing out IOTA as a payment method, and also to run the overall operations of the station. Again the market got super excited about IOTA and for good reason. We are entering the age of electric cars, as the world comes to the realization that current modes of transportation are no longer tenable. That’s why many developed nations have put deadlines on the phasing out of fossil fuel based car engines from their roads, some as near as 20 years from now. In essence, if this test is anything to go by, we could be staring at a scenario where IOTA becomes an integral part to what could be a seismic shift in 21st century transportation. That would be a sure bet to the future value growth of IOTA and investors are taking note of it. Now some even bigger news has come out today. 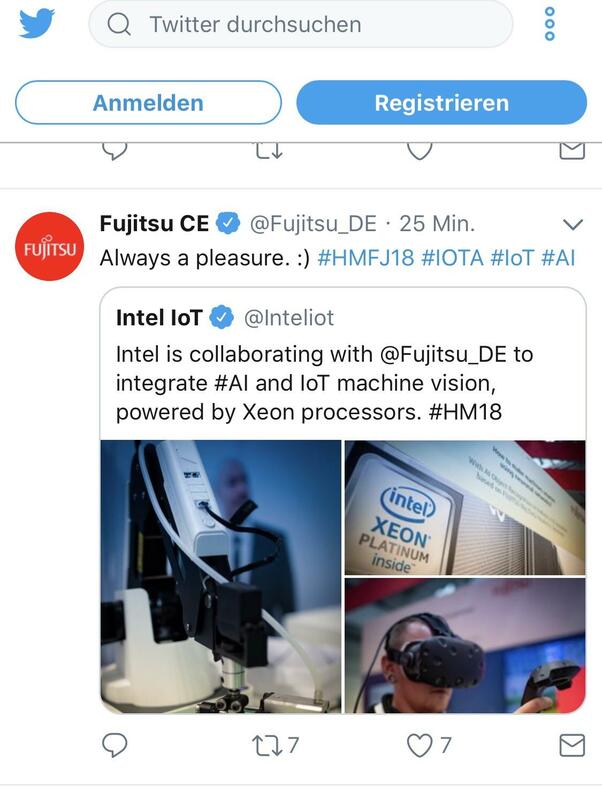 Fujitsu, a Japanese multinational is working together with Intel to integrate IOTA and artificial intelligence into their systems. Without reading too much into it, this could mean an embedding of IOTA technology into Intel chips and that would essentially make IOTA opportunities pretty much limitless. One thing is clear from all this, IOTA is the technology of the 21st century. We are entering the age where everything is getting smart, and big data and artificial intelligence are part and parcel of everyday life. As all this happens, IOTA (MIOTA) will continue to grow. If it’s current rate of growth is anything to go by, I believe IOTA (MIOTA) could be in the triple digit valuation in the next decade. This is not just another crypto, this is tech that makes blockchain look like old school technology.